Millions of Americans don’t practice good oral hygiene, which is the #1 reason teeth decay and fall out. Good oral hygiene coupled with good nutrition can help prevent gum disease, tooth decay and even bad breath. It will also help us to be able to straighten your teeth without damage and provide you with a more brilliant, beautiful smile. There are many tips for keeping your teeth healthy and strong. Many of these tips have to do with nutrition and overall good oral hygiene. Good nutrition can aid in better health for you and for your teeth. We want all of our patients to be able to achieve a healthy mouth, but the first steps begin before you even come to our office. At Belmar Orthodontics, learn more about good oral hygiene and how orthodontic care can help you! Sometimes, the basics are the hardest to do because they seem so simple. You skip brushing one night, then you do it again, and soon it starts to become a habit. When it comes to braces, we see patients skip on the basics here and there all the time. Why? This is most likely because braces take a little bit longer to care for than teeth without braces. Skipping on proper brushing and flossing can seriously damage and erode the tooth enamel. We recommend brushing and flossing at least twice a day, if not more. After every meal would be ideal, but not everyone makes a habit of doing that. What happens when you don’t brush and floss the teeth properly? You develop dental caries. The American Dental Association reports that 91% of adults 20 years old and older have had dental caries. 27% had untreated tooth decay. What does this mean? It means that 91% of people have had cavities and 27% had untreated cavities that will continue decaying. The National Institute of Dental and Craniofacial Research reports that dental caries is the most prevalent chronic disease in the United States in both children and adults. The sad part? It’s completely preventable. Tooth decay occurs when proper oral hygiene practices are not followed. When we eat and drink, bacteria in the mouth mixes with sugar to make acidic plaque. That plaque coats your teeth and over time, erodes the hard tooth enamel. Inside the tooth is a soft, pulpy center that contains nerves and sensitive parts of the tooth. When hygiene practices are skipped, that plaque will erode the teeth enough to break down the enamel and seep into the soft, pulpy center. It will then have a heyday and cause as much decay as it possibly can. Mild tooth decay will result in fillings for cavities. Severe tooth decay will result in a root canal or a dental extraction. The great part about all of this? Tooth decay is completely preventable! All you have to do is take care of your oral health! Brush after every meal. Brushing will help prevent staining and will reduce the potential for bacteria buildup. Food can easily become trapped in the brackets and can erode the tooth enamel around the brackets. Make sure to use a soft brush to brush down from the top, then up from the bottom on each bracket and tooth. Use a floss threader. 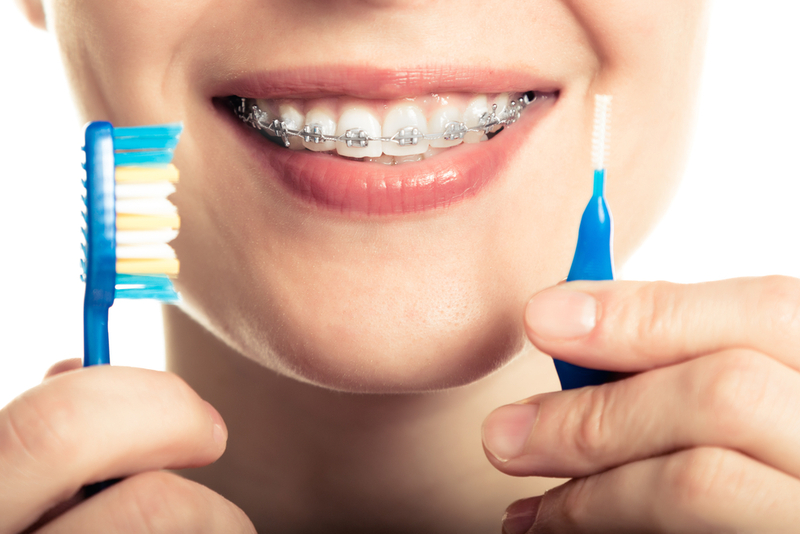 You can’t skip flossing when it comes to braces as it’s even more important now than ever. Tooth decay often happens between the teeth with braces. Using a floss threader will allow you to insert the floss through the teeth and above or below the wire. This allows you to clean effectively in between each tooth. Do this several times a day! Avoid certain foods. Hard foods are a no-no with braces and can break brackets or become stuck in the teeth. Avoid hard candy, chips, ice, apples, crusty bread, nuts, popcorn, corn on the cob, carrots and any other hard candies. Avoid chewy candies or foods such as caramel, toffee, taffy, starbursts, licorice, tootsie rolls, gummy bears and more. For a more comprehensive list of food items, you can always call our office. Over 64 million Americans suffer from gum disease, tooth loss and tooth decay. Poor dental hygiene and tooth decay make orthodontic care that much harder to perform. The point is to get your smile straight and beautiful without making it weaker. Our orthodontic techniques are effective and strong when it comes to getting your teeth in proper position. We want all our patients to have beautiful, straight and strong smiles. It’s vital that you follow proper oral hygiene practices every single day and that you double your efforts while wearing braces. If you need help with your oral hygiene routine or braces maintenance, call our Belmar Orthodontics office today at (303) 225-9016.